Bicicapace - J.C. Lind Bike Co.
Bicicapace is an Italian bike company based in Milan. They're a fairly young company, conceived around 2006. In Italian Bicicapace means "bike+capacity"; knowing that and seeing their unique "pelican" design makes clear the real purpose of their bikes: to carry all the stuff our lives demand to be carried. Bicicapace bikes come with robust city bike features like sturdy rear racks (for carrying groceries or even a child seat), full coverage fenders, dynamo-powered lights, and internal gear hubs. 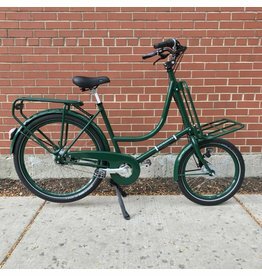 All the features you'd expect from a fully equipped Dutch bike, and done with the style and elegance of Italian bike-making.